I walk past the strangely quiet beer garden, almost unrecognisable with daylight, a locked gate and empty tables. Past our local hawker corner, suddenly undergoing renovations, so no crowds of people drinking Kopi-O and eating roti, noodles and congee. Past the aromatic and always busy Katong 328 Laksa, the darkened Chinese dumpling restaurant run by former basketball players, its empty dining area echoing with a CD of chanting monks. I stop outside a doctor’s surgery. The two block walk from our house has left me dripping, sweat rings at my neck and under the arms. Next to the doctors office is a Catholic book shop. The next shop along is a wine bar (called Denise on my credit card slips), then the Wizard of Paws pet shop. I love Singapore’s quirkiness. Such an eclectic jumble of Asia and the West. Pity the weather is just so unbearable, I think, as drops of sweat form on my eyelids (I kid you not). Across the road, a burnished older man loads up his truck outside Nippon Paint. The paint shop magically vanishes at night, its shutters the invisible backdrop for a street dining strip. The rollers are down on the Sin Hoi Sai Eating House, which shares the footpath area at night with the Five Star Hainese Chicken Rice Restaurant. A few Five Star staff, wearing burgundy smocks and white hats, are making preparations for the trading day, slow and easy as befits the ungodly hour of 10am. The shutters are also down at the furniture shops at the corner. They keep gentleman’s hours there, opening at lunchtime and operating well into the night. 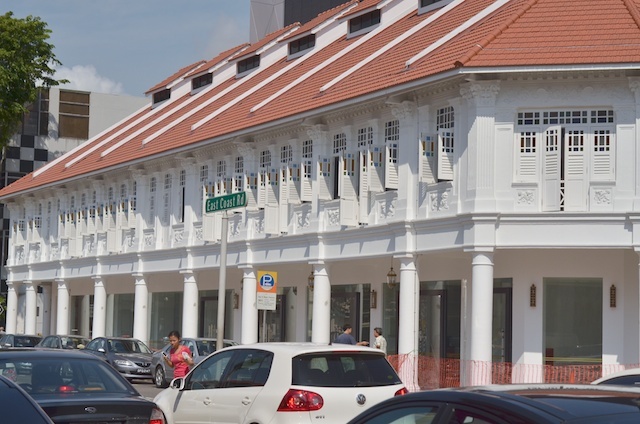 Further along, a nearly-renovated strip of shophouses is blinding white in the morning sun. I don’t think I’m going to see the final product of the renovation. We leave in about a week. My bus lurches into the marked yellow safety zone. I step aboard, swipe my bus pass and climb up onto the top deck to enjoy the cold air blasting from the air-conditioner vents. We bump past the enormous Hong Kong Roasted Delights, Sarpino’s Pizza, Kashmir Indian Restaurant; past cafes, shopping centres full of maid agencies and beauty salons, past child care centres. Then a series of condo complexes. I peer into the always-empty glass-walled gym of The Esta, at the always-empty pool. 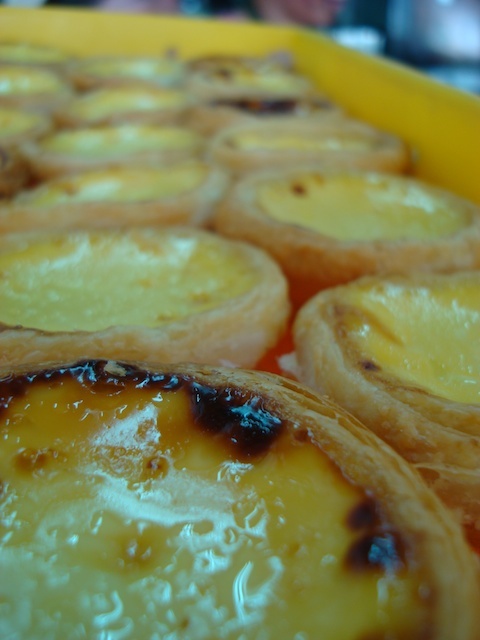 The bus turns at the corner and we trundle down Tanjong Katong, another foodie street. Seventh Manna Cake Shop, Canadian 2-For-1 Pizza, Bruno’s Pizzeria and Grill, Korean Restaurant, Bee Chiang Hang, Yan Kee Noodle House, Smith’s Fish and Chips, Kampong Chicken Restaurant, Java Kitchen, Madeleine’s Original Portuguese Egg Tart, With A Pinch Of Salt, North-South-East-West Fusion Restaurant, Bombay Cafe, Punggol Nasi Lemak, Sun Dessert Cafe, Ziweitang Folk Soup Pot Restaurant. 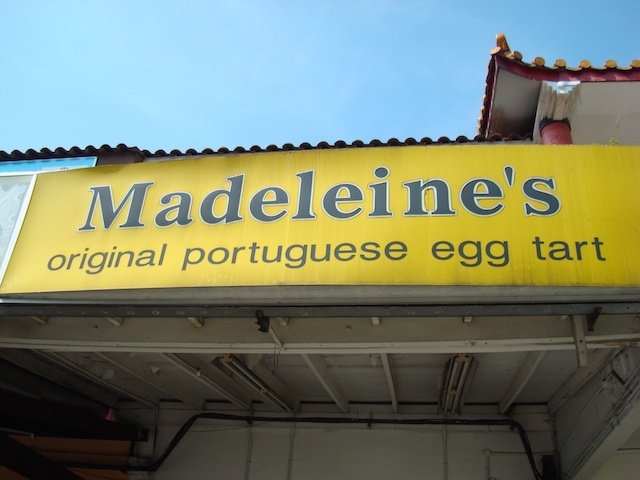 So many places, all appealing and — apart from Madeleine’s — all untried. Just not enough time. We turn again, into the non-event part of the commute. Northlight School, “a school of hope and inspiration”, a red brick institution with rolls of barbed wire atop the fence, banks of towering HDB flats, blocky hawker centres, more flats. Another turn, past pleasant playing fields and tennis courts and a construction site of Olympic proportions. A glimpse of canoes and palm trees as we cross the first bridge over the Singapore River. In the distance, the Singapore Flier, an enormous and overpriced ferris wheel. The bus disgorges half its load at the Suntec shopping complex. I look longingly at Mad For Garlic, a ground-floor restaurant that I’ve wanted to try ever since I saw its crazy name. Then we reach the barricades that have gone up for this weekend’s Singapore Grand Prix. Behind the fencing, colourful temporary seating and a three-storey commentary box. Amazing to think that next week this area will be a grassy open space again. Then we pass “tourist Singapore” – the durian building, the Merlion, the Fullerton Hotel, Marina Bay Sands looking like banana perched on a wonky set of cricket stumps, the hand-shaped Arts Science Museum. Yet-another construction site, La Pa Sat Festival Market — a Victorian-era open-air eatery famous for its night-time satay stalls. Almost at my stop. We go under an ugly pedestrian overpass, my signal to press the button, scamper down the steps and emerge into the sauna-y swelter of Singapore. Thinking about our limited time left in Singapore, I have a nostalgic moment for the bus. Then I do an idle calculation: 45 minutes each way, five days a week over 15 months. HOLY HELL, I’VE SPENT 472 HOURS ON THE BUS SINCE WE MOVED HERE!!! That’s a full MONTH! Nostalgia vanishes. No wonder I haven’t had time to explore Singapore or eat at all those great-sounding eateries I look at forlornly, day after day. I’ve wasted a month on the bus. I force myself not to calculate how much time I’ve spent at work, or getting ready for work. Focus on the second dropout, I tell myself. About a week to go. Really puts it in to perspective when you figure out you’ve actually spent that much time on a bus over one year. You won’t know what to do with yourself when you get to CM! I’m fixated on the 1&1/2 on the bus each day. I bet that was motivation to focus on the dropout! It was a huge motivation, Kent. Because, with a small baby, I really could have done with an extra hour and half of sleep a day. a WHOLE GARLIC RESTAURANT? that is reason enough to go to singapore. i can’t blv how much time your commute took. that is asinine. looking forward to your next journey! Great post! Sorry we missed you the other night. Good riddance bus! Agree completely that one MONTH out of 15 being spent commuting is a strong rationale for deciding to move on. Life is too short to settle for something less than what you love or the best approximation of that!